Below is a short list of places that will be the focal point of the game. If you have any questions, feel free to post them. 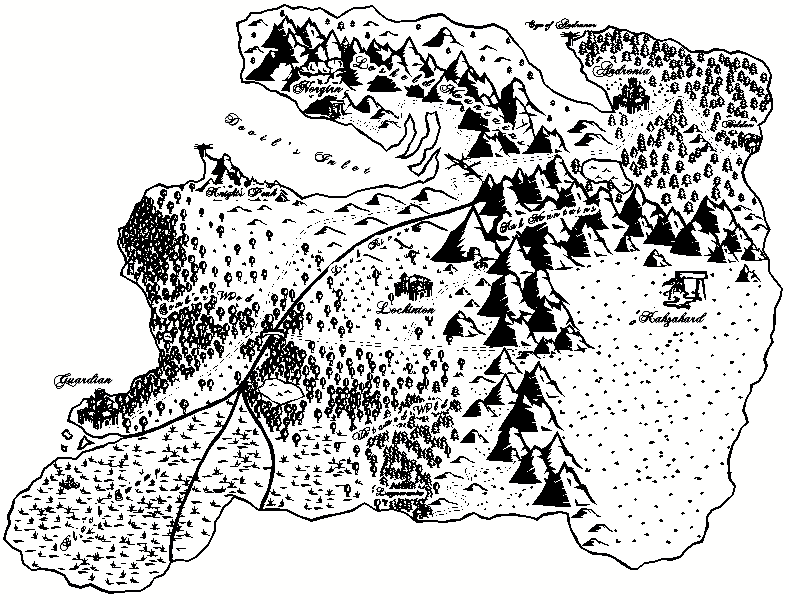 The starting city of the campaign, Lockinton is a medium sized melting-pot. Due to its large mining operation, migrant workers, merchants, and the associated riff-raff alike, have found their way into the city. While Humans make up most of the general population, all races can be found here. Because of its wealth and remote location, the city is the only one in these lands that is not governed by the council in Guardian. Instead a wealthy man and proclaimed King, Jacob Tabber has taken charge of the city and its people. Capital of these lands and beacon of hope to the rest of the world, Guardian is the largest city on the continent. Guardia has been governed from this city since before records were kept but it has not always been by this console. Kings, knights, clerics, wizards and noble heroes have all once ruled from here over the surrounding lands. The council is a more recent change that was installed when the previous rulers, the Knights of Gaspar, disappeared into the Rahklif Mountains years ago. Quaint village of the elves hidden among the Untamed Wilds. The actual location is only speculated and it is only easily found by its inhabitants. Little is known about the village besides the fact that it is almost exclusively inhabited by pure-blood elves. Common name for the southern central forests that are protected by &quot;wild elves&quot; indigenous to the area. Swamps that have formed south of Guardian. Location of the great keep formerly known as White-Rock, now Black-Rock, where the Knights of Gaspar once occupied. Known location where people aspiring to become a Knight of Gaspar train. It is here that these brave souls go through the trails and tribulations that are required to wear the crest of the Knights of Gaspar. Andronia is ruled by King Beldon Persalous II, a wise yet simple human man. Andronia is a prosperous port town at the western side of Raife. The population of the city is almost completely dominated by humans, but non-races are not treated harshly. It is rumored that the town is watched over by a long deceased legendary sorcerer by the name of Andrunor. Beldon was once a small village but is now a prosperous port town. Its name was changed from Hallotree to the current in honor of King Beldon I after his death 30 years ago. A cluster of Northern mountains often associated with mystery. Many travelers ventured to this mountain range to find themselves lost or worse, never to return again. Long ago, groups of dangerous crazed barbarians used to wander these mountains attacking seemingly random surrounding areas and people. Since those times, the mountains have been mostly avoided and the attacks have become increasingly rare. Norgirn is the great city of the Dwarves. Built into the southern side of the Loshed Mountains, the city was once exclusively inhabited by dwarves, but has more recently opened its gates to the surface. Some of the populous still believes they should live in seclusion and do not agree with the current decision to open its doors. A Rumored city built inside of a volcano somewhere in the Loshed Mountains. It is said that only the most powerful beings and spell-casters dwell here in seclusion from the rest of the world. Ancient Elven holy lands across the oceans. It is rumored that this is where elven elders go when they are done experiencing the world abroad. Only seen as a mirage in the deserts east of the Rahklif Mountains, it is said that the city and its population were stolen thousands of years ago by a powerful wizard.